Sunday morning -- the sun is shining and we had a bit of rain late last night (which we desperately need), and another new challenge starts today at Scribble & Scrap. We always have an "Anything Goes" theme so there's absolutely no excuse not to play along. You don't have to use a Scribble & Scrap image or digital papers to enter the challenge but they are all so lovely, why wouldn't you want to use one or the other or both? I used the sketch from Outlawz Sketch challenge this week. This vintage lady is colored with ProMarkers, then die cut. I printed two of the blue papers from the set, and die cut one for the mat behind the image. The second paper for the background is double printed at the bottom to make the darker strip but it's only one piece of paper. I added no embellishments at all because I just wanted to show off that beautiful image and the gorgeous papers. This has to be the most CAS 'vintage' card I've ever done but I think it qualifies as somewhat elegant, don't you agree? The image comes from Aurora Wings and is called "Dragon Babies." Aurora Wings has a fantastic FB page which you should visit for some wonderful inspiration. I chose to use the sketch from Sketch Saturday. The image is colored with ProMarkers, then die cut. The mat is die cut from dp by K & Co. and the background dp is also K & Co. The ribbon is grosgrain and was in my stash. The bow is one of those I make by the dozens. The glittery border is actually made using "Design Adhesives" diamonds and green glitter. I'm still experimenting with various gitter and adhesive techniques. I really like this one! This is set to go live on Saturday morning and if it gets posted as scheduled, I'll be very happy. We've suffered two power outages this afternoon, one just as I was getting ready to write up this post. Boom, no power! Then it came back on for about 10 minutes (just long enough to get everything reset on the computer and fix the two electric clocks in the house) and then, snap, out again. It's back on now but who knows? I've set the scheduler first thing and then added the photo and I'm hoping to get the post finished without any further problems. :-D But, if you're seeing an unfinished post, it went out again and I'll finish it when I can. Today is the start of our next challenge at Open-Minded Crafting Fun and this fortnight we want to see buttons on your creation. That's it -- make whatever you like but be sure to add some buttons. We have 4 wonderful sponsors, one of which is QKR Stampede and I used a fun image supplied by them. Our other sponsors are: Digi Darla, Gerda Doodles, and Oak Pond Creations. 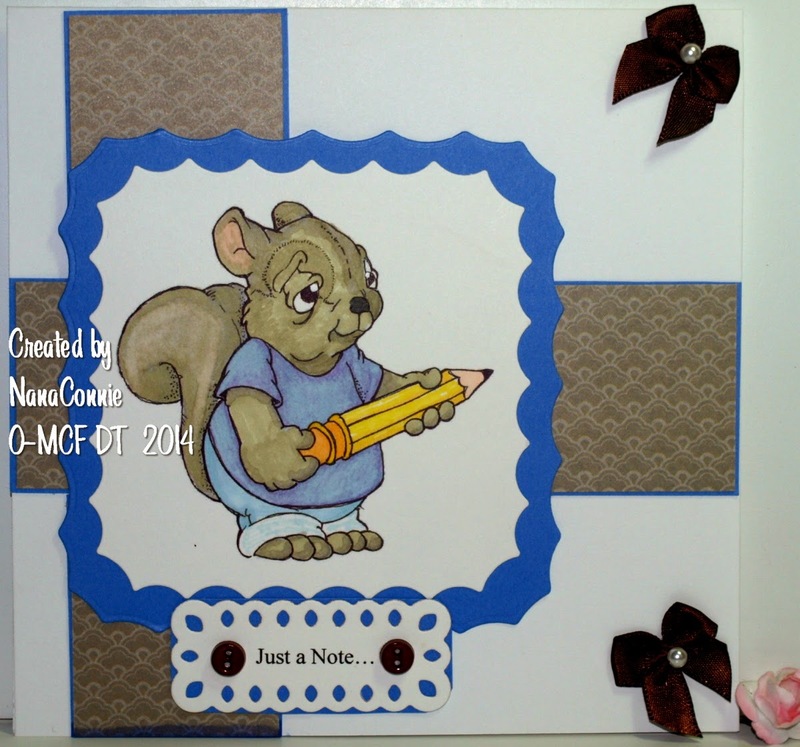 Here's my card using "Writing Squirrel" from QKR Stampede. I'm probably going to use this card myself to write a real note to a friend. Shocking idea in this day and age of e-mail, isn't it? My sketch came from the Outlawz Wednesday Sketch challenge. I started with the sketch at Speedy TV (twist: add bling), turned sideways. I added the pearl swirls and the metal brads for a bit of bling but the card is still flat enough to fit into a regular envelope for mailing. 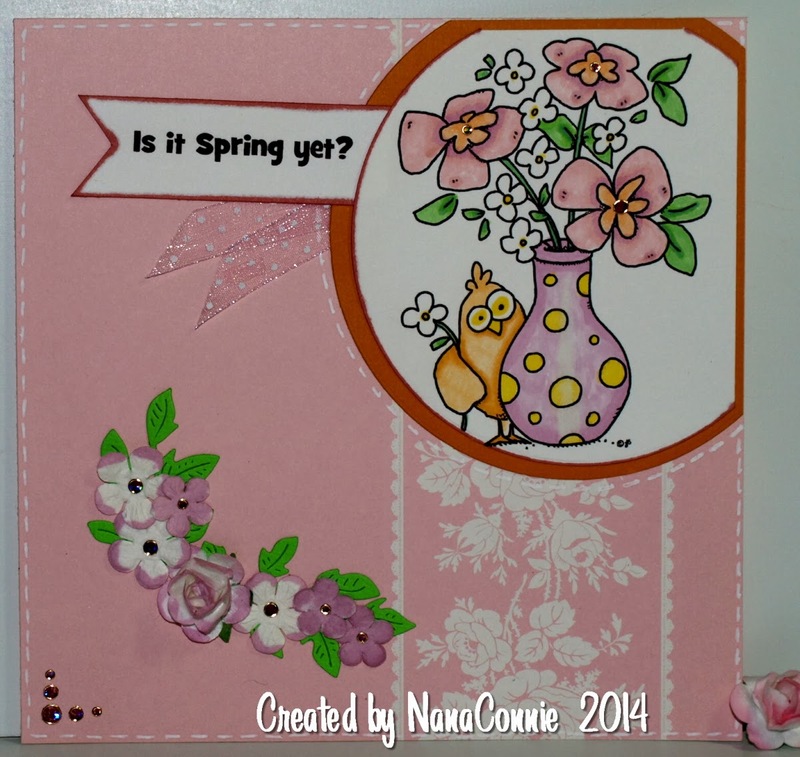 I know most of the country is looking forward to spring being here and I'm no exception so I'm making springtime cards. I've been sniffling and sneezing and coughing with the last of the winter colds (I hope it's the last) so my crafting has taken second place to resting and getting better but I did manage to make this card this morning. I used an image called "Bouquet Chick" by From the Heart and also used their sketch. 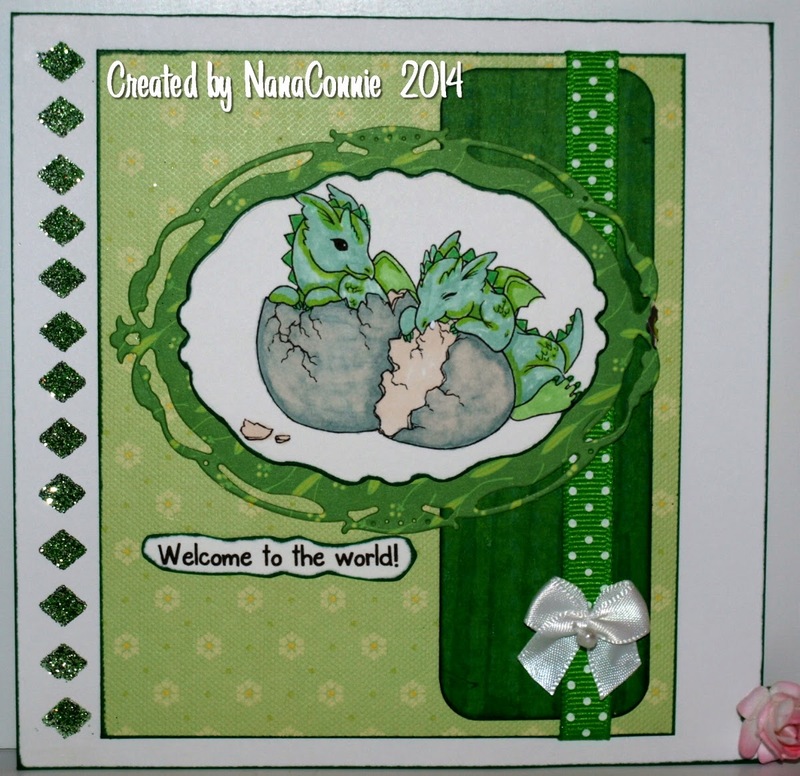 The image is colored with ProMarkers, die cut and added to a die cut mat. The background dp is from Anna Griffin, her "Georgette" stack. That was one of those "must have" purchases which has now lain idle in my stash for more than a year! Polka dot ribbon came from Really Reasonable Ribbon and the 7 flowers were in my stash. I added a bit of color to each of them with a marker, then put rhinestones in the centers. The leaves were cut with a die from Cheery Lynn. Can you believe all those flowers but still a ton of open space? The sentiment is mine, printed with a computer font and ink outlined. I added the stitching using a white gel pen. Finally, I added 5 rhinestones to the lower corner. 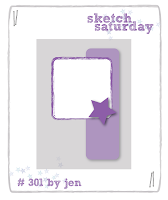 It's Saturday and that means another challenge has started over at Open-Minded Crafting Fun. We have four more fabulous sponsors this fortnight (Dilly Beans, Flat Friends, The Stamping Chef, and Whoopsi Daisy) and a great new theme, "Something Green." Well, not only am I getting prepared for the green of spring, I'm thinking of St. Patrick's Day and my own Irish heritage. Today's card is a tribute to all of the above. 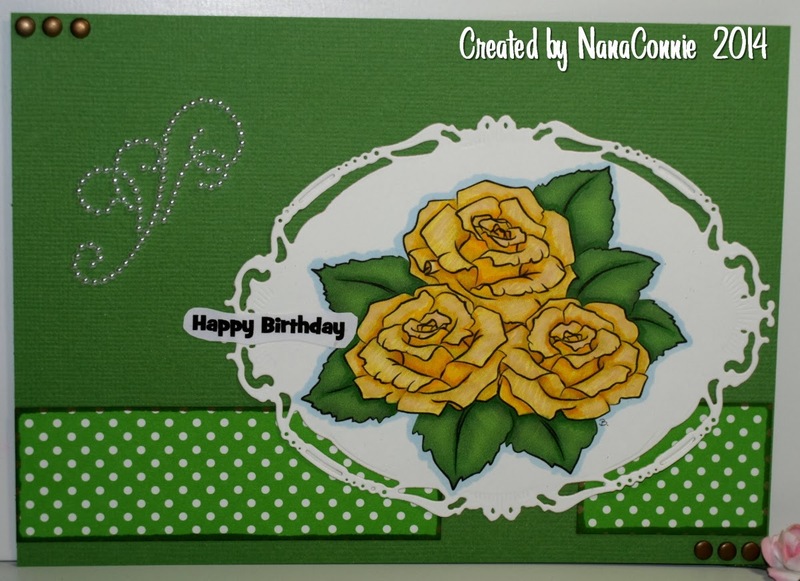 The image is from The Stamping Chef and it's called "Louisa Mae." I used the sketch from The Outlawz Sketch Challenge this week. I tried a new technique on this card which I learned about a couple of weeks ago. It has to do with "velvet" glitters which I discovered over at Sparkle n Sprinkle (challenge theme -- use loose glitter, EP or flocking), which are micro fine glitters with an incredible look and feel. Let me tell you about making my card and we'll get to the glittering technique in order. I colored the image with ProMarkers, and then die cut it with one of my framing dies from Spellbinders. I kept the outer (negative) piece, chalked the edges of it with mint green chalk, then laid it back around the frame piece. I took a piece of sticker paper, peeled the paper off one side and laid the image and outer piece onto the sticker paper. 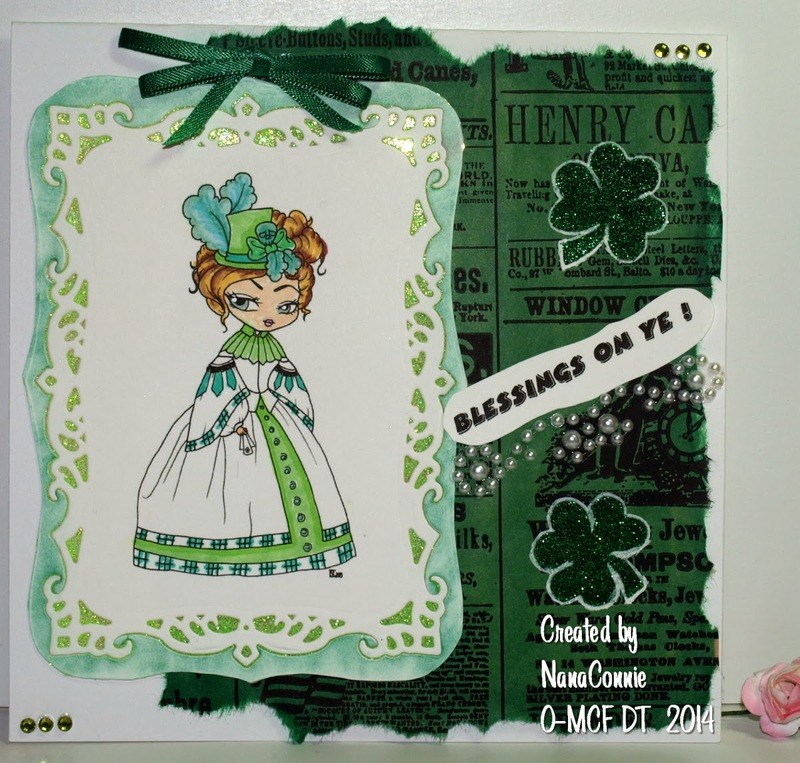 I added the triple bow and the shamrocks (also die cut from sticker paper and glittered), then the sentiment, pearl swirl, and gems in the corners. I wish the sparkle of the velvet glitter showed up better in the photo. I guess you'll just have to take my word for how sparkly it is IRL. I love this sticker paper technique and plan to do a lot more practicing with it. I want to try some other masking techniques with it as well. In case you're wondering, yes, I had glitter everywhere! lol But that's because I seem to be a glitter magnet when I try to use anything more than the teeniest pinch of it at a time.